Sam Simon Passed away at the age of 59. 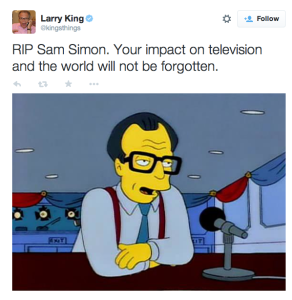 Samuel “Sam” Simon, a nine-time Emmy Award winner for comedy, and co-writer to the ever so infamous animated sitcom The Simpsons has passed away early Monday in his Palisades home at the age of 59. In 2012 Simon, was diagnosed with late-stage colon cancer. And was only given three months to live by his doctors. 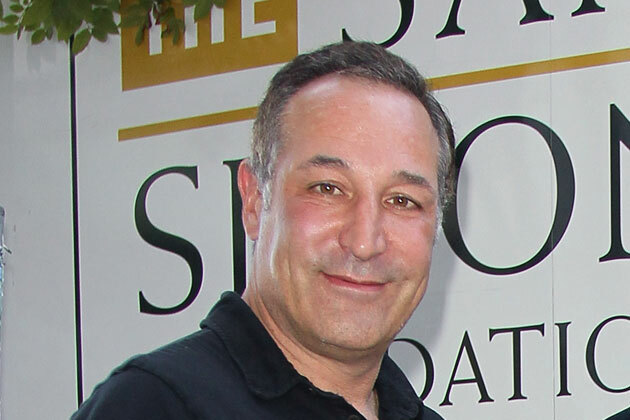 With this news Simon gave away his $100 million fortune to The Sam Simon foundation, which rescues stray dogs and trains them to help people with disabilities. Along with his own foundation Simon, also donated to other charitable efforts. So thank you Simon for sharing many laughters with the world through your work, and creating till this day one of the greatest comedy sitcom. You will be missed. D’oh! Below are a few messages shared on Twitter by The Simpsons show runner Al Jean and Hank Azaria along with other celebrities.